My brief vacation (3 days off to use up vacation time before my retirement date) is up and I'll be heading back to work this afternoon. It's been nice having extra stamping time due to dentist's orders. I had a couple of tooth extractions thanks to splitting them vertically! Apparently I'm grinding my teeth in my sleep and though he rarely sees vertical fractures, I took the prize by having TWO of them! Enough of that talk. Let's go on to this gorgeous inspiration photo for the current Card Concept Challenge! When I saw the blues and greens, I knew I wanted to do some alcohol ink blending on Yupo paper. I'm still pretty new to this process, but did really love how the background turned out! April is a killer month for birthdays, so that was the theme I used. I recently acquired the Rose Flurries 3D die set by Altenew and I'm in love with these gorgeous blooms! 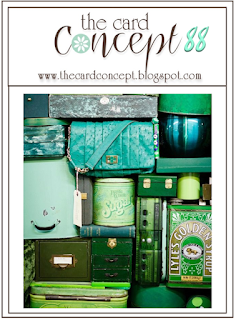 If you like these dies, you don't want to miss my March 17th post where I've got a card that I'm saying is my favorite of all times (and I've been stamping a LONG time!). My cardstock choices were all from my huge leftover pile of scraps, so I don't know the exact color names. STAMPS: Sending and Wishing (Simon Says Stamp). DIES: Tall Stripe Panel (Reverse Confetti); Wishing (Simon Says Stamp); Rose Flurries 3D (Altenew). MAR 8 - "Life is a ticket to the greatest show on earth." Ouch on your teeth Wanda! hopefully you won't grind as much after you retire??!! and I hope you got a mouth guard to wear at night! I clench - and I can't get to sleep without my guard in now! Love your beautiful alcohol background - you could have that alone for your card! 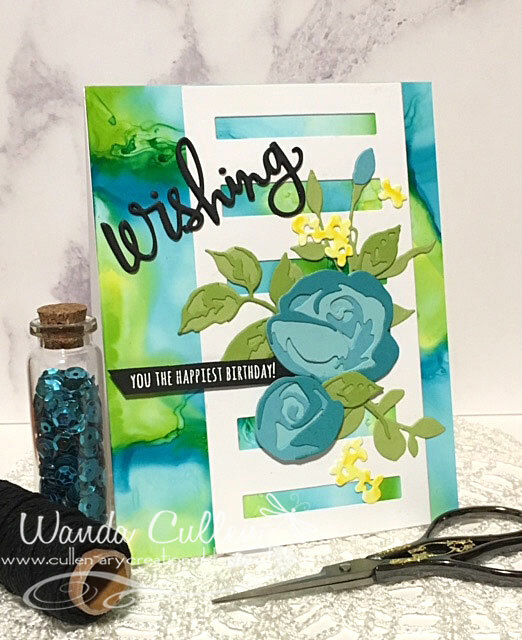 but your die cut blooms are gorgeous in these colors - a lovely card! Everything about this card screams GORGEOUS! Thanks so much for joining us at The Card Concept.